​Eastern Region Trailheads are organized around the Chamberlain's Ranch shuttle route, the route all Top-Down Narrows hikers take. 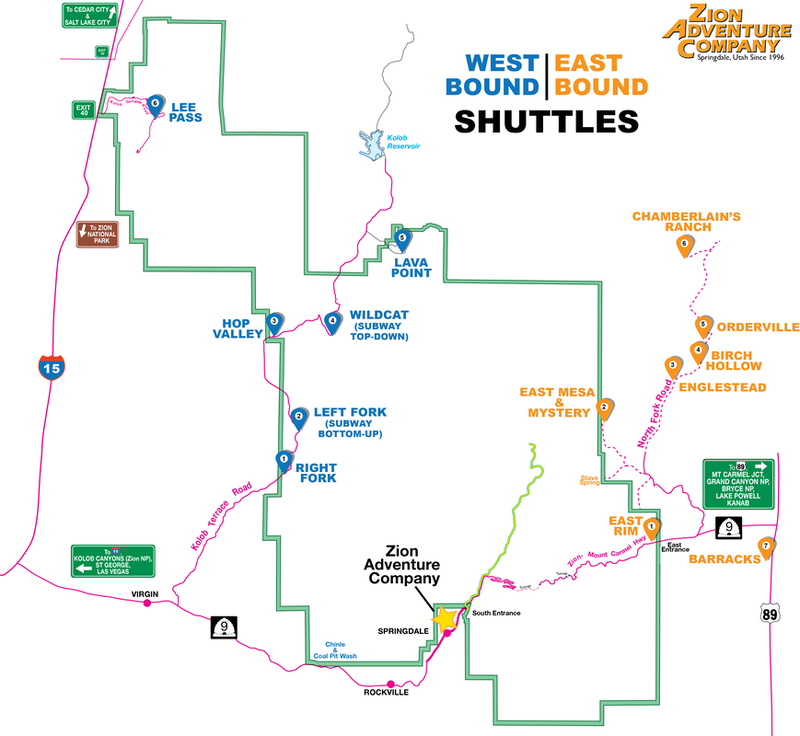 Along the way, we service these additional trailheads: East Rim, Englestead Hollow, East Mesa (Mystery Canyon), Birch Hollow, Orderville Canyon. We also offer custom pick-ups and drop-offs by customer request. We organize an efficient shuttle schedule, enabling the most hikers to get to their desired trailhead promptly while also minimizing shuttle prices and our carbon footprint. The time restrictions indicated in each tab help us manage this efficiency effort. Please know that exact shuttle arrival times are impossible to predict, as weather and traffic conditions, as well as customer timeliness, sometime affect our schedule. Cancellation Policy: You may cancel your reservation up to noon (12pm) the day before your schedule departure for a refund. You will be refunded the full amount, minus the $5 reservation fee taken at time of booking. This is the primary trailhead for the Zion Narrows Top-Down Hike. Please be aware that the final 13 miles to C.R. are on unimproved roads, and become impassable when wet. Departs seasonally at 6:15 am and 9:30 am. Meet at Zion Adventure Company (36 Lion Blvd.) at least 15 minutes before departure. Maximum shuttle capacity is 14. Shuttles typically fill during peak season. Most hikers use this trailhead for hikes to Observation Point, Deertrap Mountain, and/or Cable Mountain. 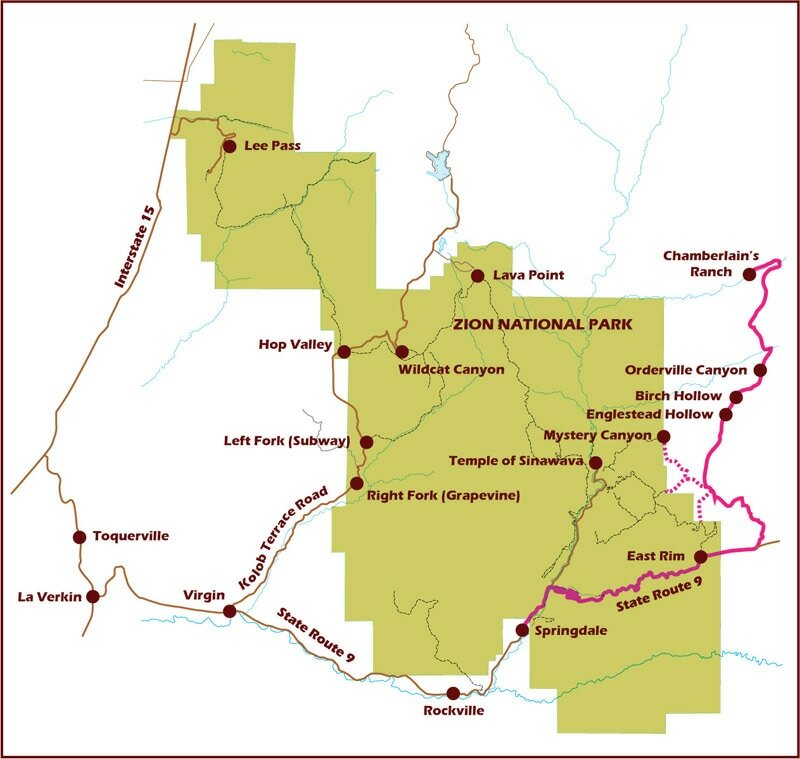 Most hikers visit one or more of these destinations, then continue through to Weeping Rock Trailhead, in Zion Canyon, rather than return to this trailhead. This trailhead is often used for Mystery Canyon or day hiking to Observation point (finishing in main canyon.) Please be aware that road becomes impassable in wet conditions. This stop is at Gifford Ranch off of the North Fork Rd., a public access jeep road parallel to Birch Hollow, 2.8 miles from Pondersosa Ranch. This is the easiest route to the head of Englestead. You have to know the route to the canyon in advance, however, as it is not obvious from the drop-off point. Check out Tom Jones's Zion: Canyoneering book before your trip. This stop is at Birch Hollow, a popular Canyoneering route just off the North Fork Rd. You can finish this route out Orderville Canyon into the Narrows with a permit from Zion National Park. This stop is at the gate, less than a mile into the Orderville WSA jeep road off of the North Fork Rd. Orderville Canyon runs into the Narrows. For hikers traversing the entirety of Zion from West to East. You leave your vehicle at the East Rim Trailhead , where we pick you up and take you to Lee Pass trailhead. Please note that this shuttle could have several other stops. We meet you at the East Rim Trailhead at 5:50 am, then promptly travel back to Springdale. We load up additional hikers, then depart Springdale promptly at 6:30 am. Please be aware that this route includes the potential for several other stops. Arrival times may vary from 7:30am - 9:30am. ALERT: due to road closure, LEE PASS (TRANS ZION) SHUTTLES WILL BE UNAVAILABLE APRIL 30Th - FALL 2018. call for details.